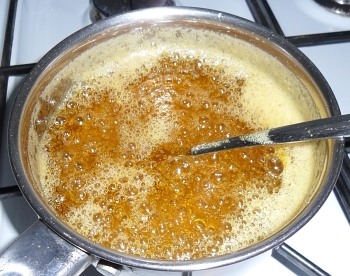 This syrup is used as the basic sweet ingredient in a number of recipes. this and also, can have a white substance visible on them. seeds in place whilst you grind them. Put the sugar in a milkpan. In a clean, dry mortar, put three or four cardamom pods. Use the pestle to break open the pods (cover the top with your hand) and empty and remove the pods, leaving the seeds behind. Cardamom seeds are a bit slippery and soft so add a pinch of sugar to help the grinding process and then grind it to a find powder. If you are not sure about how much adding some of the sugar helps, try grinding it without and see how coarse the results are. Then add a pinch of sugar from the milkpan and continue grinding. 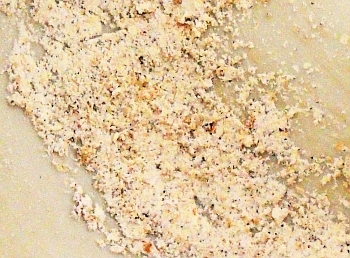 The resultant powder will tend to clump but that is not a problem - it is held together by the sugar which will dissolve. This is all of the saffron you will need. Add some water from the cup - a couple of teaspoons to dissolve the sugar and make a suspension of the cardamom powder you have made - and wash it into the sugar in the milkpan. Repeat the washing a couple more times. Clean and dry the mortar and pestle. Put a pinch of saffron into the mortar - the picture on the right shows you all that is needed. picture above. Keeping it dry lets it grind like this. 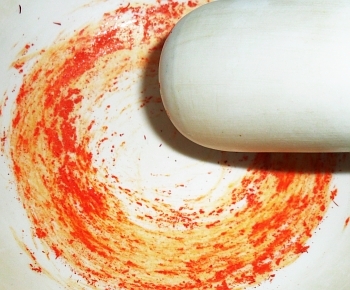 Using a circular motion, grind the saffron into a fine powder. 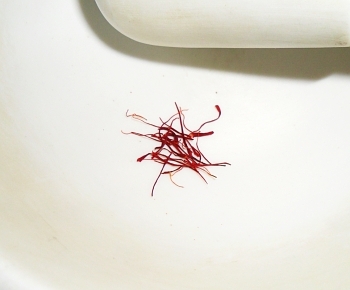 This is a tiny amount and whist saffron is particularly expensive, you don't need a lot - as you can see. 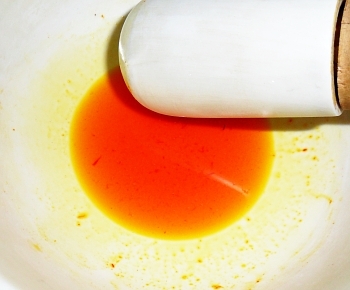 The saffron dye in water. Add some of the water from the cup to the mortar and grind the saffron powder into it so that you have a suspension like that on the right. Now tip that into the milkpan without spilling any of it and repeat until you have washed all of the saffron into the milpan. Here, I have poured the cardamom and the saffron into two separate parts so that you can see how it looks. 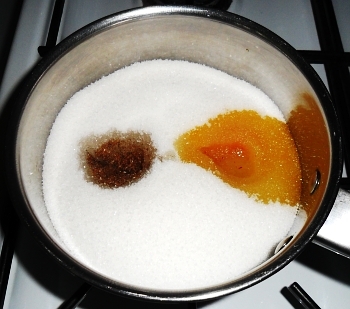 Next, add around two thirds to three quarters of the water from the cup to the sugar and put on a moderate heat. Stir with a fork, all of the time. You should not be able to smell the cardamom and saffron working together. Heat it up until all of the sugar dissolves and beware that there is a stage in this process where a lot of froth is formed so be careful not to leave it on its own. Turn it down a little when this happens but afterwards, you can turn up the heat again. If you start to get what looks like scum appearing on the surface, you can remove it by skimming it off with a teaspoon. boiling to make two and three thread. Whilst it boils, you need to know when it has cooked for long enough. 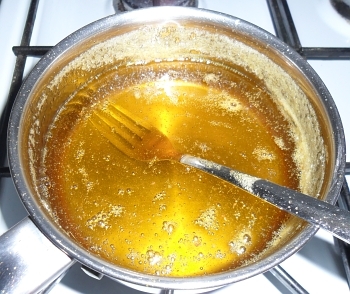 The way to do this is to put a few drops of the syrup on the work surface to cool using a fork or teaspoon. Put the end of your index finger in it and press it against your thumb. Separate your finger and thumb and look to see if there are any threads as in the image on the right which shows one such thread. For this syrup, you want two or three threads. Final syrup. Keep it warm for use. This is the final syrup. When it gets gold it will either set solid or form a thick syrup. When you have finished using it, just let any surplus cool down and then pour it into a jam jar through a sieve - when you come to use it again, simply reheat it as though you had just made it.